Highlights include 41.0 metres @ 1.19 g/t gold & 13.9 metres @ 2.32 g/t gold. Mineralization remains open for expansion. Vancouver, British Columbia - Velocity Minerals Ltd. (TSXV: VLC) ("Velocity" or the "Company") announces that it has received laboratory results for three additional diamond drill holes at the Company’s advanced Rozino gold project ("Rozino" or the "Project"), located within the Tintyava prospecting and exploration licence area in southeastern Bulgaria (Table 1). 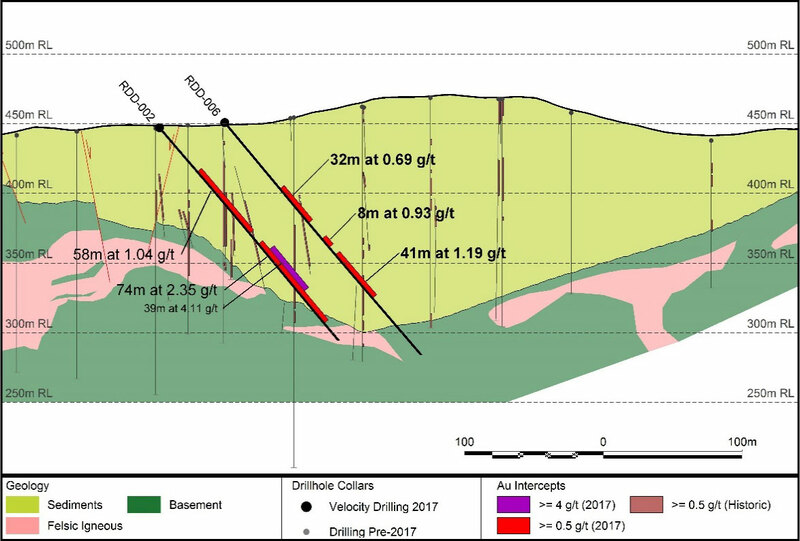 All three boreholes intersected broad zones of gold mineralization which demonstrate excellent continuity and further support the potential for a near-surface, bulk tonnage, open pit development project. Drilling at Rozino is ongoing with eleven drill holes completed to date and mineralization remains open for expansion. Holes RDD-005 and RDD-006 are 50m steps outs from holes previously released (see NR17-05 and -06 for details). 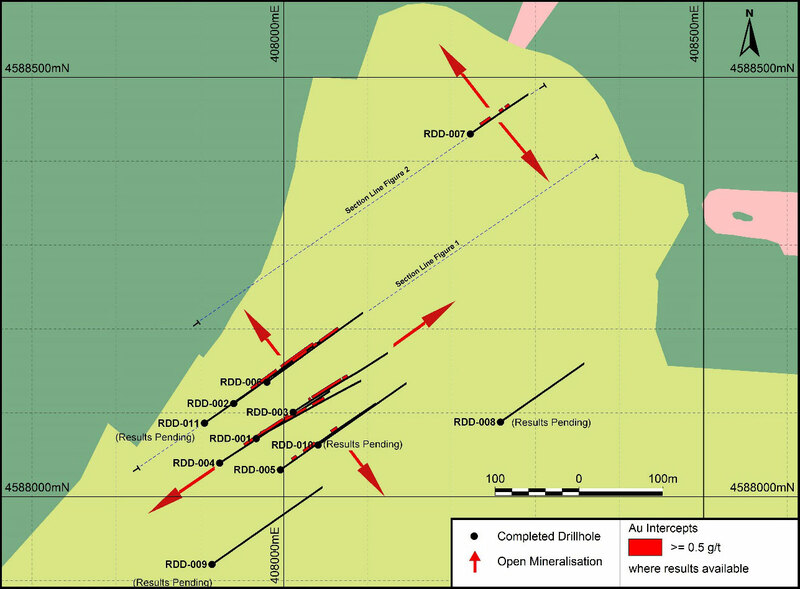 RDD-005 (Figure 3) returned 3 intersects above 0.5 g/t gold for over 50m of cumulative mineralization, including 13.9m @ 2.32 g/t gold. 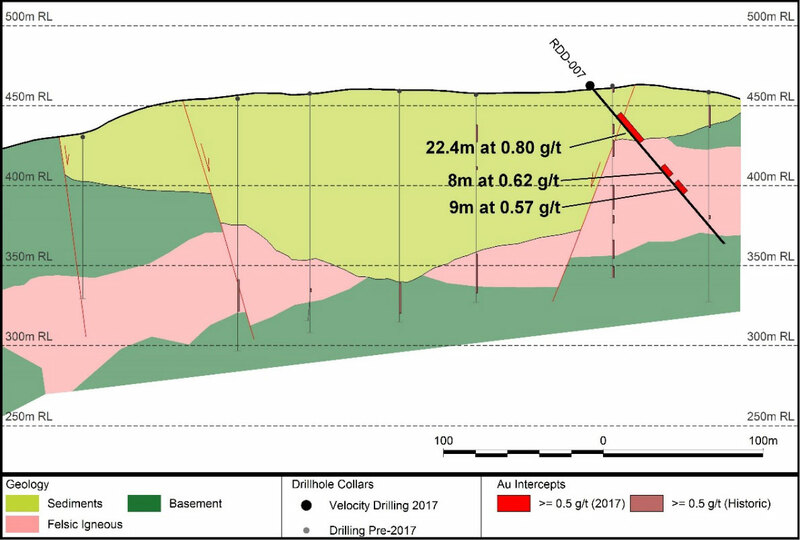 Hole 6 returned 3 intersects above 0.5 g/t gold for over 80m of cumulative mineralization, including 41.0m @ 1.19 g/t gold (Figures 1 & 3). Figure 1: Drill Intersect from Velocity Hole RDD-006 at Rozino. Results for RDD-002 were released previously. RDD-007 collared approximately 200m to the northeast of the main Rozino target and was designed to test the potential depth extents of historic trench results. The hole intersected mineralized sediments grading 0.80 g/t gold over 22.4, before passing into faulted granites returning 2 additional intersects. These results are very encouraging and a program of trenching to better define the nature of the mineralization is underway prior to further drill testing of this target later this year. Table 1: Drill Results from Velocity Drill Holes RDD-005, -006 & -007 at Rozino. Figure 2: Drill Intersect from Velocity Hole RDD-007 at Rozino. Figure 3: Location of Velocity’s drill holes. Holes completed are shown in black. Results have been returned for holes 1 through 7. A total of eleven holes have been completed and drilling is ongoing. CAUTIONARY STATEMENT REGARDING FORWARD-LOOKING INFORMATION: This news release includes certain "forward-looking statements" under applicable Canadian securities legislation. Forward-looking statements include, but are not limited to, statements with respect to: future exploration and testing carried out on the Tintyava property; use of funds; and the future business and operations of Velocity. Often, but not always, forward looking statements can be identified by words such as "pro forma", "plans", "expects", "may", "should", "budget", "scheduled", "estimates", "forecasts", "intends", "anticipates", "believes", "potential" or variations of such words including negative variations thereof, and phrases that refer to certain actions, events or results that may, could, would, might or will occur or be taken or achieved. Forward looking information involves known and unknown risks, uncertainties and other factors which may cause the actual results, performance or achievements of the Company to differ materially from any future results, performance or achievements expressed or implied by the forward-looking information. Such risks and other factors include, among others, operating and technical difficulties in connection with mineral exploration and development and mine development activities for the Tintyava property, including the geological mapping, prospecting and sampling programs for the projects, the fact that the Company’s interests in the Tintyava property is only an option and there is no guarantee that the interest, if earned, will be certain, actual results of exploration activities, including the program, estimation or realization of mineral reserves and mineral resources, the timing and amount of estimated future production, costs of production, capital expenditures, the costs and timing of the development of new deposits, the availability of a sufficient supply of water and other materials, requirements for additional capital to fund the Company's business plan, future prices of precious metals, changes in general economic conditions, changes in the financial markets and in the demand and market price for commodities, possible variations in ore grade or recovery rates, possible failures of plants, equipment or processes to operate as anticipated, accidents, labour disputes and other risks of the mining industry, delays in obtaining governmental and regulatory approvals (including of the TSX Venture Exchange), permits or financing or in the completion of development or construction activities, changes in laws, regulations and policies affecting mining operations, hedging practices, currency fluctuations, title disputes or claims limitations on insurance coverage and the timing and possible outcome of pending litigation, environmental issues and liabilities, risks related to joint venture operations, and risks related to the integration of acquisitions, as well as those factors discussed under the heading. "Risk Factors" in the Company's annual management's discussion and analysis and other filings of the Company with the Canadian Securities Authorities, copies of which can be found under the Company's profile on the SEDAR website at www.sedar.com.